Next up for March Muffin Madness we have gluten-free Sneaky Chocolate Peanut Butter Muffins from Kathryn of ChaCha’s Gluten-Free Kitchen. Okay, I’m going to confess and tell you this recipe is my favorite so far. I know, I know … that’s clear bias and all the muffins to date have been fantastic, right? Yes, they have been and I’ve been just as delighted as you all have been with each and every one of them, but these muffins from Kathryn are flourless and there’s a special place in my heart—and tummy!—for flourless recipes. You’ll find many flourless recipes here on gfe. Flourless recipes are naturally gluten free and have richer, fuller flavor from real food ingredients without flour weighing them down or “interfering” with other flavors so to speak. 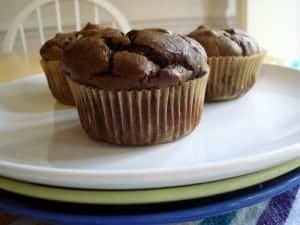 I am sure that Kathryn’s Sneaky Chocolate Peanut Butter Muffins will live up to every expectation of flourless recipes! Her recipe is gluten free, grain free, and vegetarian, with a dairy-free option. UPDATE: This giveaway is now over. Enjoy learning more about Kathryn and her Sneaky Chocolate Peanut Butter Muffins and see the whole line-up of bloggers, blogs, and muffin recipes here. If memory serves correctly, I met Kathryn about 2 years ago via my gfe Facebook page. She was such a positive reader from the start, always leaving lovely comments on my posts there. But it wasn’t until she left a similar kind comment here on gfe that I realized that she had her own blog. I’ve been following ChaCha’s Gluten-Free Kitchen ever since and have really enjoyed not only her simple and delicious recipes, but also her very helpful product and restaurant reviews. Since she’s a real food person, her product reviews are few, but they’re always worthwhile. And after I read and commented on so many of her restaurant reviews, Kathryn and I are certain that we’re going to meet up some time in the future for a wonderful meal together. Kathryn lives in North Carolina, the home of Mr. GFE’s college alma mater and, therefore, one of our frequent destination spots as most of his college buddies still reside there. And now I’ll give the floor to Kathryn so she can share a little bit about herself and her blog and then tell you how she created her Sneaky Chocolate Peanut Butter Muffins. Seeing how others create recipes can be so helpful in learning how to bake gluten free. It can even lead you to create your own delicious creations! 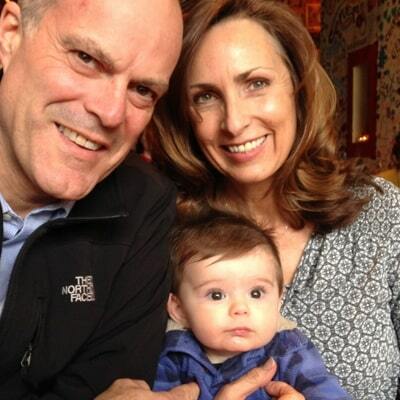 I started ChaCha’s Gluten Free Kitchen as a way to share the recipes that worked for my family with friends. We are not only gluten free but have other food and chemical sensitivities. As a long time Feingold Association member and volunteer, I share recipes that are free of artificial dyes, flavors and sweeteners. Like Shirley, I found using whole foods that are naturally gluten free the best way to stay healthy and enjoy our meals. As an aside, my blog name came from my sweet little neighbor friend who was unable to say my name and renamed me ChaCha. It has stuck and now he, his sister, and many others use it. It’s the only name my grandbaby knows me as. This is my new love—a healthy muffin that tastes like a peanut butter cup! Using butternut squash is the sneaky part. Years ago when we were beginning our journey to better health, I found this recipe on Pecan Bread. It was fast and full of protein so it made me happy—it tasted like a regular banana muffin to my family so they were happy. It was an easy recipe to adapt depending on what type of nut butter I had on hand and what type of fruit or veggie was handy. Carrot pulp straight from the juicer was actually a favorite—they were just like little carrot cakes. I made dozens of them in all shapes and sizes and flavors and eventually just stopped making them and forgot about them. But then I checked out the Pecan Bread site again for a friend and saw my old favorite. I realized it was the perfect base recipe for an idea I had been playing with. I wanted to sneak butternut squash and all the vitamins and minerals it contains into a muffin. I also wanted a peanut butter cup flavor but not an overly sweet muffin. These came out exactly as I’d hoped. They call for baking soda and apple cider vinegar which may sound funny. However, the chemical reaction between them gives the muffins those wonderful tiny bubbles and soft texture of regular flour baking. If you’re Feingold Stage 1, you can substitute any approved vinegar. Anyone—gluten free or not—will really enjoy these gluten-free Sneaky Chocolate Peanut Butter Muffins! Kathryn says these flourless, naturally gluten-free muffins with a secret, sneaky ingredient offer a peanut butter cup flavor without being overly sweet. Preheat oven to 375F and grease or line muffin tins. Mix together all ingredients except chocolate chips with stand mixer or food processor until creamy. Spoon into 18 muffin tins and bake for approximately 15 minutes. They will feel soft and won’t get a browned crust. Test with a toothpick to be sure. Kathryn uses flax gel "eggs" for an egg-free, vegan version. Originally published March 21, 2014; updated July 26, 2017.
oh these look yummy! May have to try with almond butter as my daughter has a peanut allergy. Thanks for sharing a great recipe! I’d love to hear what you think of them if you use almond butter. Do you ever substitute cashew butter or sunflower seed butter? Omg, this I have to try!! I have made these with pumpkin when I don’t have quick access to squash. They are wonderful! When our family went gluten free Cha Cha’s blog was our guide. So many mouth-watering recipes! Thanks, Leah. Your support always means so much. OMG OMG OMG Someone bake me a muffin. STAT! Gorgeous. Sneaky indeed! Pinning to make another night! Can’t wait and may possibly never tell the secret ingredientt! I think I may have found my new love. These look delicious!!!! Cannot wait to try them!! So I’ve had celiac for 20 years and have avoided baking because I am just not good at it and thought I always had to mix 6 kinds of flours to make anything (that’s what it was like 20 years ago) So I’ve relied on all the new store bought gf options but admit I waste a lot of money on items that taste terrible. So finding this blog has been life changing!!!!!! I am making these muffins in just a few hours, can’t wait. That’s exactly what held me back from gluten free baking for the first couple of years. Those store bought options are getting better but I agree that they are overpriced and not usually as good as homemade. I hope they worked for you! Looks delicious and the recipe is easy. Will be making these for sure. I can tell you first hand these are amazing!!! ChaCha is my sweet mother in law & I’ve had the privilege of having these right out of the oven! Make sure you check her blog for other yummy treats! She also has many other recipes with sneaky-healthy ingredients! I have sometimes wondered how you can tell if the crust is browned (or not, in this case!) if the batter is dark! I was an accomplished home baker in my pre-GF days and so I know how to tell when the crust is done, but it’s good that you include the toothpick test for less experienced bakers! It’s all new kitchen chemistry, isn’t it Susan? It gets easier and easier as time goes on. Love the idea of adding butternut! Kathryn, these look delicious! I am going to make these. I love butternut squash! They look wonderful. These look so delicious and very tempting, what a fantastic recipe! These are beautiful, and look absolutely scrumptious! Thanks for sharing the recipe! 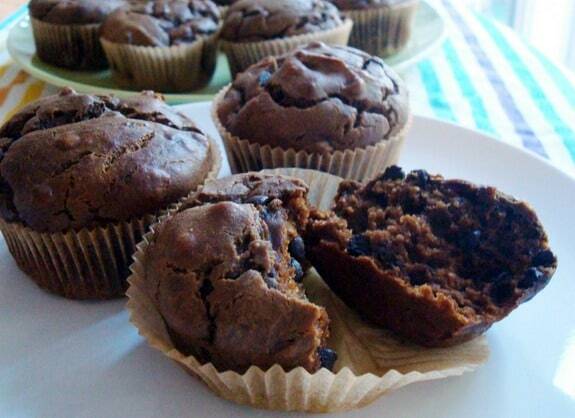 These muffins look real yummy…especially with the chocolate. Ive made flourless pumpkin brownies before that my family loves using almond butter. I’m excited ti try these out. We love butternut squash. What a fun way to use up leftovers!! Thank you – I love the hidden veggie!! Yummy! I’m def going to try this one! Need to find a way to make these without the sugar. Will a stevia for baking work as a substitute? Marilyn, I have not made them sugar free but I have used less sugar with no change at all in texture. I haven’t tried stevia but I would think it could work. Please post another comment if you make them with stevia. Could this also work with pumpkin puree? Yes, Megan. I love them with pumpkin, too. There is a slight pumpkin flavor which you don’t get with the butternut squash. Not only is this gf, but it’s also very low in sugar. Maybe I’ll try honey. Can’t wait to make them!! It is low in sugar, just barely over a teaspoon per muffin. Less than some use in their morning coffee. Honey sounds amazing. peanut butter and chocolate – yum! I am making these Easter. I gave up chocolate for Lent. I just put this in my calendar to make. Can’t wait! Can’t go wrong with peanut butter and chocolate! I would guess any nut butter would work! These sound fabulous! I like that these have butternut squash! Thank you for making my life a lot sweeter and tastier!! Love your recipes !! Love the Chocolate, peanut butter ans squash in a muffin. Ok. I cannot wait to try these. Nutritious and they look wonderful. I share what I make with four others who cannot bake for themselves. They are going to LOVE you!!! What is the importance of baking soda? Could I swap with baking powder? The baking soda and vinegar react together and form the tiny air bubbles you find in non-gf baked goods. I have left out the baking soda and vinegar and they are still great. These look SO good. Love the hidden squash! WOWZA!! What an idea! I have to try this recipe. My one problem being finding the butternut squash in the springtime…??? Would pumpkin puree work? Pumpkin will work, but you will taste it slightly. I still really like it. Butternut squash disappears. I am usually able to find canned butternut squash year round at Whole Foods. Oh – we don’t have access to Whole Foods in our area. I’ll try my favorite Market of Choice – a small local chain store. It’s wonderful. Thanks! Or maybe Trader Joe’s would have it? I think TJ’s only has it during Thanksgiving. But my TJ’s does have pre-cut butternut squash in the produce section which could be steamed and pureed. WooHoo! I found the canned variety at Market of Choice!! Now to make the yummy looking muffins!! Thanks again!! I just made these with sesame butter (that’s all I had) and they are OMG awesome!!! That’s great to know Chere! Thanks for posting! This is one of the best combinations! I’ll have to see if I can work around the egg issue..
Wow, what a cool recipe! Wow, I have to try this! Looks so yummy! Wow, these muffins sound really different. Can’t wait to try them. Oh wow – these sound so good! I can’t wait to make these for my niece and nephew! these look amazing, I definitely need to try these. These look so easy and yummy I bet my 9yr old will love them!! These look so good! I love that there is no “flour” in the recipe and just uses butternut puree…so much better! Can’t wait to try these! They look so yummy. I have to meke them really soon. I am making these today!!! They look awesome and the ingredients are not scary – and in fact I have all of them in my kitchen. Yahoo. I like that these re not scary to you! Hope you enjoy! PB and chocolate – a winning combo! Can’t wait to try these! I’m happy to have found your website. Go Spartans! i am intrigued. looking forward to trying this and and going to share the recipe with my gf buddy right now. thanks! Will have to make these. This is one I definitely look forward to trying. These are the muffins that brought me to this site. Can’t wait to try them! These muffins sounds sinful! Can’t wait to try them. thanks for the egg free version! These sound & look like they are delicious! Made these today, easy & delicious. Any idea of calorie count? Made these this weekend and they are as good as you think. I would half the vinegar or even leave it out. It does provide a slight after taste I didn’t love. But over all it is a GREAT treat! Interesting, you can totally leave it out if you like. The texture will not be too different. This is a neat recipe! I think I’ll try it with almond butter in one batch. I love sneaking in vegetables! Great job! Yum, I have to make these!!! Squash? Holy cow! Can’t wait to sneak these by my hubby! He’s the ultimate decider in gf pass or fail! The butternut squash puree sounds like it would make the muffins super tender and delish! These are definitely going to bake up super moist. Why is ACV an ingredient, what does it do? Thanks for the recipe! The ACV reacts with the baking soda to form lots of bubbles and give the muffins a nice, light texture. Do you know how long to bake these if you were to bake them as a cake instead of muffins? It’s my daughter’s second birthday. The pan is roughly 8×10 inches (it’s shaped like a bunny). I was happy to do it – my glass pan, approximately 7 x 11, took 36 minutes. Hope your daughter has a great birthday! This turned out great. My bunny pan took about 33 minutes, and it tasted great! I did accidentally forget to add the chocolate chips, so I will try to remember that next time. But, I liked that it was not overly sweet. Thank you very much! Thank you for an amazing recipe. Look forward to trying some more. Hi Jacquie–Welcome to gfe! I’m so glad that you and your gluten-full friends (and friends of friends) loved Kathryn’s recipe! 🙂 Oh, and I hope you find many more that you love here on gfe for the March Muffin Madness event. These were so good! And we’re NOT a gluten-free household. We’ll be making these often. Thank you!!! Hi Jennifer–Welcome to gfe! 🙂 I really appreciate you taking the time to leave a comment with your family’s terrific review and I know that Kathryn, the creator of these muffins, will, too. When gluten-full families praise gluten-free recipes, that’s the highest compliment! 😉 I’m a huge fan of flourless recipes because they are simply more of the essence of the basic ingredients without flour complicating things. LOL, but that’s really how I feel. It’s lovely to meet Kathryn and discover her blog, Shirley! And those Chocolate Peanut Butter Muffins! They look delicious. I have used butternut squash in baking very successfully so I love Kathryn’s ‘secret ingredient’. Pinned. Thank you for sharing this recipe with us at the Hearth and Soul Hop. This gluten free peanut butter muffins looks perfect, thanks for sharing with Hearth and soul blog hop. pinning. We’ve been enjoying these muffins this week! What a fantastic flourless recipe. I subbed pumpkin for the butternut squash and used coconut sugar–they are perfect! Thanks for sharing this recipe. Yay, Johnna! So happy that you’ve been making Kathryn’s muffins and loving them so! I usually use pumpkin butter in my adaptation of her recipe here. As I always say, one good muffin leads to another. 😉 I’ve actually had these muffins made by Kathryn herself and I was super impressed! Mr. GFE was with me at the time and he loved them as well. 🙂 Thanks so much for taking the time to share your review here on gfe!